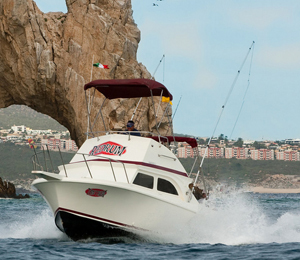 Join us for an unforgettable Cabo San Lucas fishing experience on board our 28-foot Californian, the TantRum. The TantRum is two of our smaller vessels, both of which can take a maximum of 4 passengers. On this small but upscale vessel, you and your group will ride out to the deep blue seas off the shores of Cabo San Lucas for some world-class fishing. It is no question as to why Cabo is hailed as one of the world's top destinations. Here, you can catch a some type of big species any time of the year! Whether your preference is for blue marlin, tuna, group or dolphin, fishing in Cabo is sure to get you something that you love! The fishing here is exhilarating and you will soon understand what the hype is all about. When you book the TantRum you are getting so much more than just a fishing trip. You will be getting to work with one of Cabo's most dedicated and passionate teams of fishing captains. This team knows these waters like the back of their hand. We pride ourselves in working only with the most talented and knowledgeable of fishing guides. The trip also includes a sandwich lunch with snacks, water, a cooler filled with ice, world class tackle, bait, and all your necessary fishing equipment. This is certainly one of our boats that usually is sold out weeks in advance, so do not hesitate in making your reservation! Can we keep our catches? This depends on the type of species but generally you are able to take your catches with you. You can either take the fresh catch to a local restaurant at the marina, or we can freeze the catch for you. There is a minimal fee for this depending on the size of the catch. What type of bait and how many are included in each trip? We do our best to put 10 live Greenback Mackerel or Caballito on each boat which is included in your charter price. Sometimes this amount is based on availability so please be understanding if our bait providers are unable to meet this number. Catching bait fish, at times is not different than catching Marlin or Dorado, it is still fishing. If you would like more bait, let your Captain know and if it’s available you are welcome to buy more bait at the beginning of your trip. Bait runs $30 USD for 10 bait. Do you have left-handed reels? We do have left-handed reels. If you need a left-handed reel please let us know when you check in the morning of your charter so we can be sure to have it on board for you. Yes, all of our boats have bathrooms on board. The Jacuzzi’s are on back order, but each boat is equipped with a toilet. Rojito, our 20’ Bertram, and Pangas do not have bathrooms. We use Penn and Shimano reels, custom made rods and Ballyhood lures. The standard is 10- 20% based on your satisfaction of the crew's performance. Do I need to kill my catch to mount it? You never have to kill your catch to mount it. If you’d like to mount your catch, let your Captain know and he’ll take a measurement of your fish before it is released. From there we’ll contact the taxidermy company to determine the price based on the size and length of your fish. Nowadays all mounts are made from fiberglass mold replicas, hardly any are made from the real fish anymore. How can I mount my catch? If you’d like to mount your catch, we’re glad to help you do so. You are welcome to ask your Captain or one of us in the office about pricing and shipping. How can I bring my fish home? To bring your fish home you' ll need a plastic hard sided cooler. Airlines will not allow Styrofoam or soft-sided coolers without a fight, so save yourself the trouble and get a plastic cooler. You can bring one down with you from the states or you can buy one at our office or somewhere in Cabo. Where can I cook up my catch? There are many great places in Cabo that will gladly make you a feast whether it be tacos at lunch or a fabulous dinner. Inquire in our office and we’ll be glad to send you in the right direction. Where can I freeze my catch? At RedRum we will gladly vacuum seal and deep freeze your catch if you'd like to take it back home with you. We have a commercial grade vacuum sealer in our office that does the job. There is no cost for RedRum clients for this service! It usually takes 8- 12 hours for the fish to freeze completely, depending on how much fish you have. When the fish is frozen or when you are leaving town you can swing by our office with your plastic, not Styrofoam, cooler and pick up the fish during our office hours. Where can I get my fish cleaned? Due to Mexican law and regulation, all fish are to be cleaned at the filet station; we are unable to do this on board as much as we’d prefer to do so. The filet station is located on the marina and will be your last stop before heading back to our office. As you may imagine the filet station charges a fee to clean the fish and it is often arbitrary. Your Captain or Mate will walk you through this process, no worries. Once you are done there, you' re welcome to bring it back to our office to be sealed and frozen or we can recommend a local spot for you to get it cooked up. By law, each boat is allowed to keep one billfish. However, RedRum strongly encourages clients to catch and release all billfish due to conservation efforts. If the fish is healthy the Captain will ask if you would like to bring it on board and take a quick picture. The fish’s health is our primary concern, so please don’t give the guys a hard time if they decide against it. For other species, no more than 3 can be kept per angler. We also encourage the release of juvenile species to keep our fishing grounds rich and bountiful! What is your catch and release policy? We highly encourage the catch and release of all billfish including, blue, black, white and striped marlin, and sailfish. Catching a Billfish is a bucket-list type activity; let’s ensure that our great-grandchildren get the same opportunities as we have. How do I request to fish for a certain species? Fishing for a certain type of species depends on the species, the time of year, the water temperature, currents, barometric pressures, zodiac signs, the Chinese new year, etc... Our crew will work their hardest to find the fish of your choice; however certain times of year are better for some species than others. It’s always good to have an open mind to go after species in season versus going after those that aren’t in season; it can make a difference in your catch rates. Can you guarantee that we will catch fish? Unfortunately we can’t guarantee that you will catch fish, but we can guarantee that our crew will work their hardest to get you on the fish and more often than not, get that fish to bite! What type of fishing can I expect in Cabo? We have found that many different types of fishing are successful in Cabo depending on weather, species and time of year. From trolling to kite fishing to throwing live bait to bottom fishing, any number of techniques can be used and suggested by your Captain for the best results. With this being said the technique used the most is trolling with lures. Upon finding fish, throwing bait and other methods may be used. Can we get beer or other drinks for the boat? There is a little tienda around the corner from our office, they have a good selection of beverages and they are open early. Either way; we’ll have a cooler with ice for you. Glass bottles are not allowed on board. What is included in the breakfast, snack, and lunch? We provide a breakfast snack which includes a granola bar, usually an orange or apple and a juice box. Your lunch includes a turkey or ham sandwich, chips, cookies and plenty of water. You are more than welcome to bring any other beverages or food on board as we know everyone has a different culinary taste! We just try to keep it simple and focus on the fishing. Do the captains and mates speak English? Yes, our crews are bilingual. Sometimes you need to coax it out of them, but they will do their best. Think about learning English as a second language and one day you have a family from the Bayou’s of Louisiana on board and the next day you have four guys from Dublin, Ireland. You don t need to speak any louder, but slowing it down a bit may help. I have people on board who are not going to fish - do they need a fishing license? The Port Captain doesn’t care whether you plan to sunbathe, read, nap or fish, if you are over the age of 12, you are required to purchase a Mexican Fishing License. They sell licenses at various booths around the Marina, but we always go and buy enough for everyone before you get here in the morning. The licenses are $ 20, per person, per day and are not included in your charter cost unless otherwise specified. Cabo Fishing Fleet is always interested in your tour experience with us. We hope you enjoyed your tour and love to hear comments. I have been to the Bahamas many times, but TantRum - 28' Californian is one of my favorite trips! It includes everything that everyone should do here. As a Bahamas veteran, I can say only the best about this experience!